The winding road of 206km Prithvi Highway has some of the most important religious sites in Nepal. Most visitors just rush through from Kathmandu to Pokhara on tourist buses and miss out on what the region has to offer. Several public and tourist buses run daily between Kathmandu and Pokhara, linking most of the important towns and villages en route. There are several army checkpoints along the way and the journey takes at least seven hours. Foreigners are usually waved straight through, but locals must disembark and show their bags to the authorities. Just 6km before the town of Mugling is the Manakamana Cable Car, an Austrian engineered cable car that rises nearly 1000m as it covers 2.8km from the Prithvi Hwy to the Manakamana ridge at the ancient Manakamana Mandir, one of the most important temples in Nepal. Hindus believe that the goddess Bhagwati, an incarnation of Parvati, has the power to grant wishes, and newlyweds flock here to pray for male children. Some pilgrims sacrifice a goat or a pigeon in a pavilion behind the temple. There’s even a dedicated carriage on the cable car for sacrificial goats! Built in the tiered pagoda style of the Kathmandu Valley, the atmosphere here is busy, particularly on feast days, when Manakamana almost vanishes under a wave of pilgrims, pigeons and sacrificial goats. Continue uphill for views of the Himalaya, about 3km past the small Shiva mandir to Lakhan Thapa Gufa, a sacred cave offering extended views of the mountains. Trekkers can continue west along the ridge, reaching Gorkha in about four hours. Foreigners are a novelty here and most things here exist for the benefit of pilgrims rather than tourists. 1. The bus fares are often hiked up for foreigners, buying at the ticket office reduces the chance of getting burnt. 2. Expect theft during meals stops, so keep an eye on your gear and don’t leave valuables on the bus. 3. 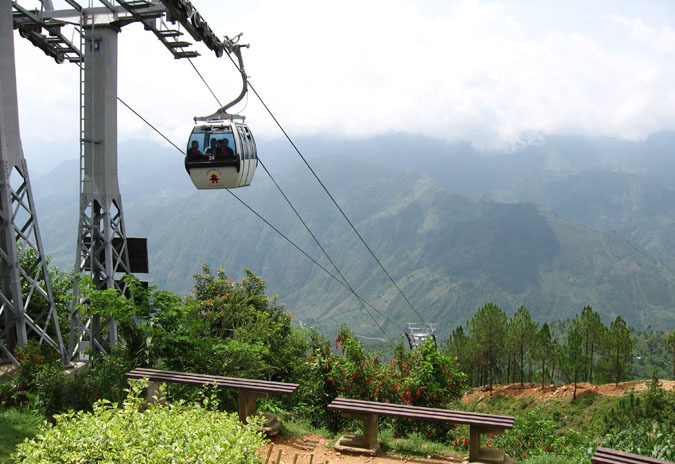 Check for safety instructions before taking the Manakamana Cable Car. 4. If you want to walk to Manakamana, the trail starts at the village of Anbu Khaireni, about 8km west of Mugling. There are several simple pilgrim lodges in the village surrounding the temple. Spacious, clean rooms with a restaurant downstairs that serves veg and nonveg curries. Located in Kurintar, this is an upscale hotel that has a prime location on the banks of the Trisuli. Swimming pool.